When a material cracks, some elastic energy is suddenly released producing vibrations that range from ultrasonic to the well known "crack" sound, a phenomeon known as "Acoustic Emission" (AE). 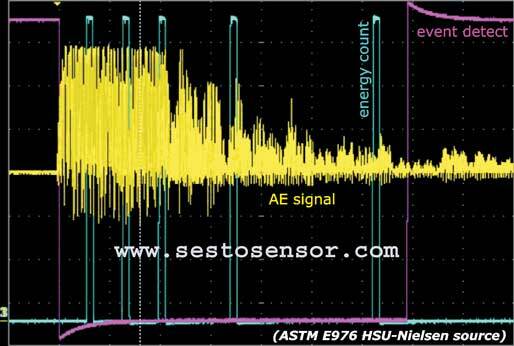 Sestosensor AE pickup recognizes just the high frequency ultrasounds that only a crack can produce and provides a damage sensor that is immune from environmental noise and sensitive enough to be installed at up to 150 centimetres from the cracking point. Differently from any other acoustic emission system, Sestosensor pickup is designed for long-term battery operations and can be directly connected to a Smartbrick unit to obtain the most complete self-sufficient Structural Health Monitoring solution. The perfect tool to distinguish ongoing damage from "dead" cracks. Displacement gauges installed across a crack are the popular sensors conventionally used for assessing if the crack damage is still evolving. But mechanical tolerances, thermal expansions and "rigid body" motions can add measurement noise big enough to hide and distort the desired information. By combining displacement gauges with the Sestosensor AE pickup, any evolution of the crack damage can be carefully and certainly assessed removing noise and uncertainties. A valuable help to identify the real causes of the damage growth. 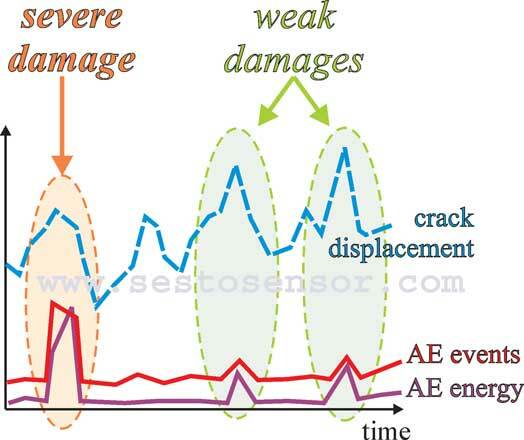 The Sestosensor AE pickup allow to understand exactly when a crack becomes active and grows, and by correlating the density of the AE events and their characteristic energy with the other structural and environmental parameters measured by the Smartbrick, it is often possible to identify the primary causes of the damage evolution, such as changes in the humidity, load, vibration and thermal expansion. 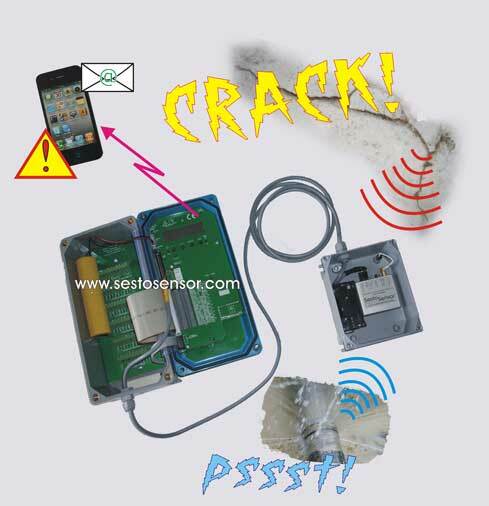 Not just cracks: using the Sestosensor AE pickup to detect discharges, leaks and scratches. Scratching a solid surface, as well as an high voltage discharge or a fluid leaking from a pressurized pipeline or tank are other sources of ultrasonic noise. 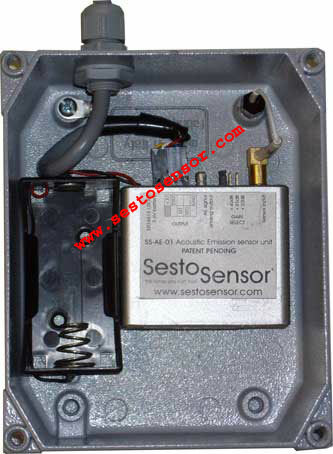 By properly configuring and customizing the Sestosensor AE pickup it is also possible to solve a wide number of monitoring needs of chemical plants, electric distribution networks, oil and gas pipelines and more. 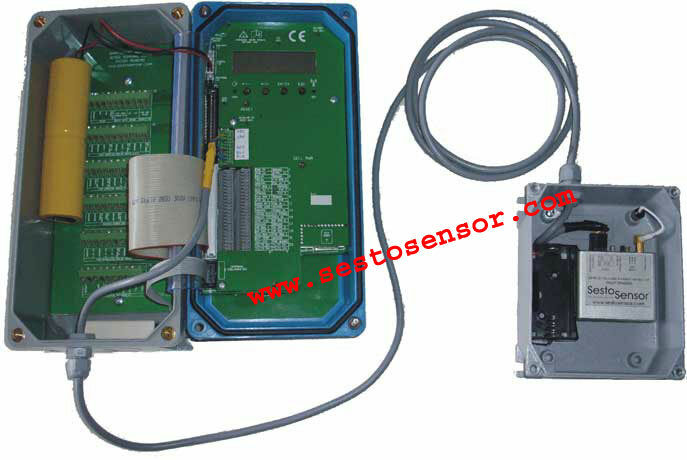 Our company is always interested in analyzing new specific problems and support your customized needs.